A short time ago, I went with my daughter to Costco. She has a membership and often times I go with her. I no longer have a membership for several reasons. We no longer live close to a Costco and with just the two of us at home, it really doesn’t pay for us to have one. But every once in awhile I’ll go with her to ‘stock up’ on a few things. One thing that Costco has that I always buy is Stonefire® Original Naan. It makes the best pizza crust! This recipe I’ll be sharing with you today is a recipe that I found on Stonefire® Original website. I changed the recipe slightly to accommodate my family but only ever so slightly. Adding a small amount of pizza sauce and spinach. 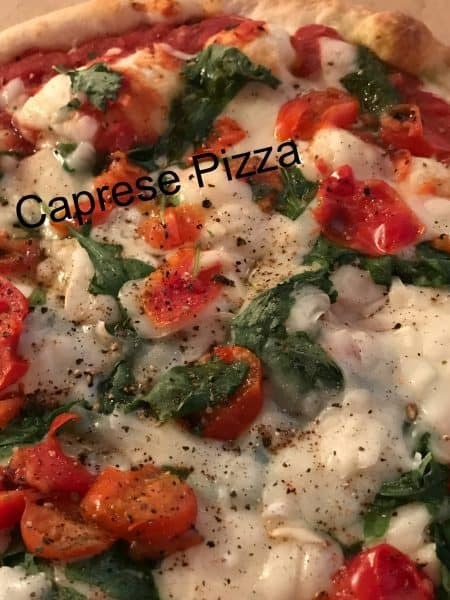 Caprese Pizza has become our new favorite Friday night pizza. There are endless variations of this recipe, making the possibilities truly endless. 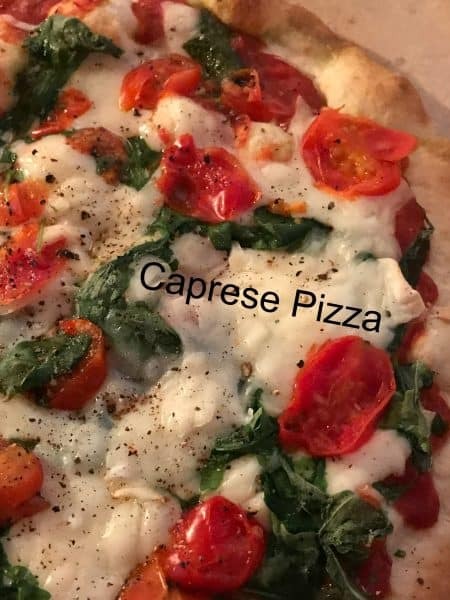 Caprese Salad [kah-PRAY-say] is a simple salad of fresh mozzarella, tomatoes, and basil. It’s seasoned with salt, black pepper and extra virgin olive oil. 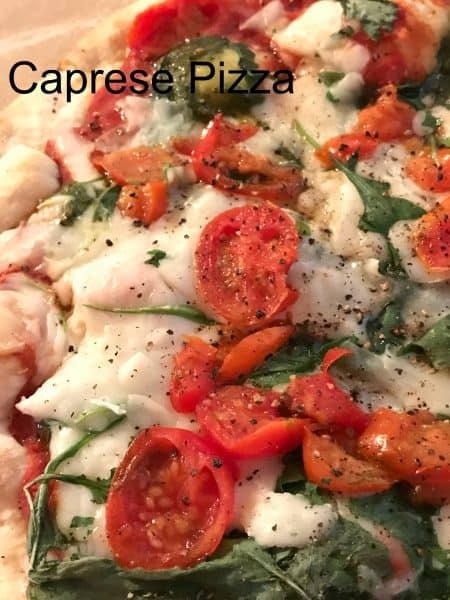 It takes it’s name from southern Italy’s island of Capri in the Gulf of Naples. 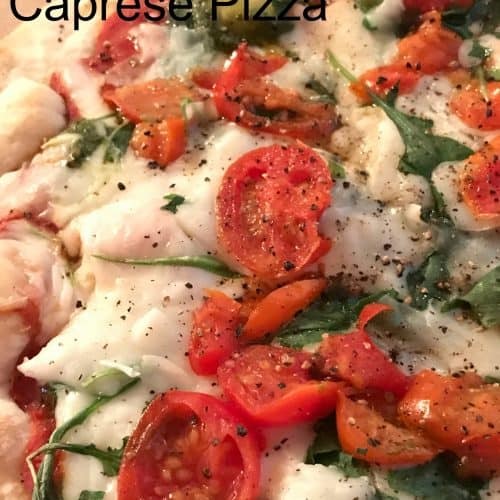 Caprese Pizza is made with this simple salad in mind. Italian food is made with the freshest ingredients therefore made in the simplest way possible. This results for the best tasting dishes. This recipe is very versatile and amounts given can be changed. Use more or less pizza sauce and/or any ingredient to suit your family tastes. Spread olive oil evenly over the 2 naan – bubble side up. Spread pizza sauce evenly over naan. Place on a baking sheet, heat for 1-2 minutes or until the bread is warm. Remove from oven and top each naan with the torn mozzarella cheese, sliced tomatoes, arugula, spinach, salt and pepper. Lightly drizzle olive oil over the top. Place baking sheet back in the oven and heat 2-4 minutes or until mozzarella has just started to get soft. Serve. What goes best with pizza? Garlic bread of course. Olive and Cheese Bread, Garlic Rosemary Focaccia Bread and Garlic Vampire Dip with Garlic Naan.